Proximal portion of the nail must be above the lesser trochanter to avoid creating a stress riser. 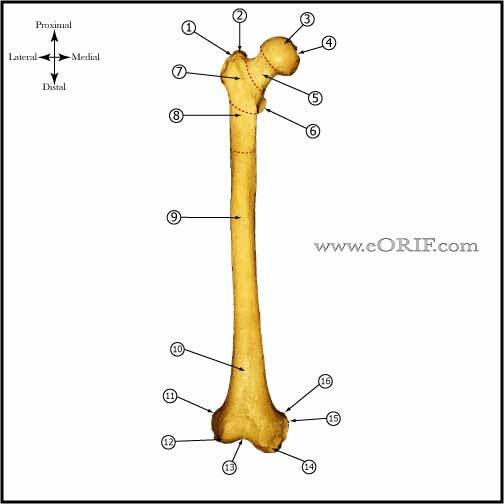 Cadaver studies show risk to femoral A. extremely low if prox A\P screw is placed above lesser trochanter. Use Synthes femoral distractor if axially unstable to maintain length. Supine position on radiolucent OR table. Bump under hip. All bony prominences well padded. Examination under anesthesia of ipsilateral knee. Ensure adequate A/P and lateral c-arms of the hip, fracture and knee can be obtained. Midline patellar incision, patella to tib tubercle, split patellar tendon, excise fat pad as needed. Guide pin placed 1cm anterior to PCL origin. Varify placement with c-arm. If reduction is unsatisfactory: femoral distractor-5mm schanz pin; proximal intertroch/lateral femoral condyle, pins placed slightly posterior. Pass guidewire across fracture site under c-arm guidance. Ream sequentially. Generally ream to 1 or 1.5mm larger than the width at which cortical chatter was achieved. Measure nail length. Nail should end proximal to lesser troch to avoid subtroch stress riser. Nail width should be 1 or 1.5mm narrower that the last reamer used. Evaluate leg length and alignment. Make any adjustments necessary. Leg can be lengthened by using slap hammer. Consider placing end cap distally to avoid risk of hemarthrosis. Malunion(rotation,shortening,angulation) rotational difference > 15 degrees from unaffected side is a true malrotation deformity. Hip and knee symptoms and functional disability occur when rotation is >20 degrees. Rotational differences <10 degrees seldom produce symptomatic disability. Post-op: Toe-touch weight bearing depending on fracture configuration. Consider weight bearing as tolerated for short oblique or transverse fractures with 100% cortical contact. Evaluate post-op xrays. Knee ROM exercises. 6 Weeks: Post-op A/P and lateral femur xrays. Advance to full wieght-bearing when bridging callus is visible on two orthogonal xrays. 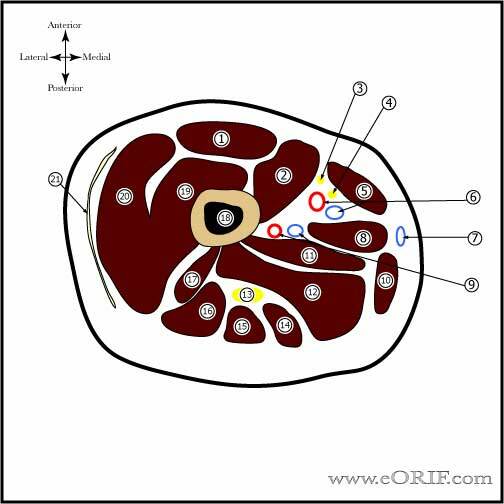 Evaluate Knee ROM. Consider PT if knee ROM is poor. Consider nail dynamization if minimal fracture callus is seen in stable fractures. 3 Months: Post-op A/P and lateral femur xrays. Consider nail dynamization if minimal fracture callus is seen in stable or unstable fractures. 6 Months: Post-op A/P and lateral femur xrays. Assess fracture callus. May return to non-contact sports. 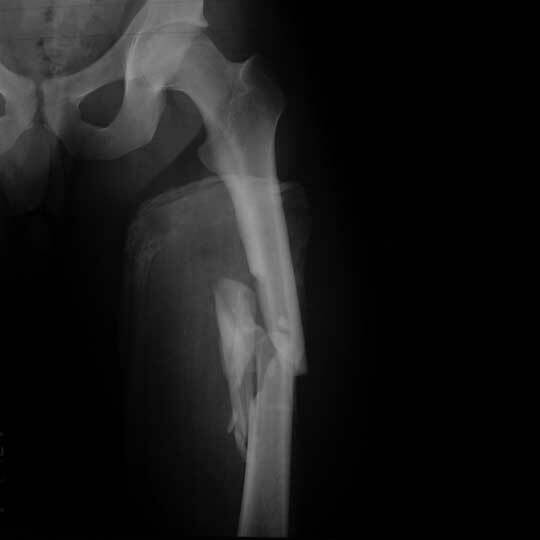 1Yr: Post-op A/P and lateral femur xrays. Evaluate outcomes. 6% nonunion, Union at 12.6 weeks, Excellent knee function with minimal knee pain. (Moed B, JOT 1998;12:334).